There's something a little bit exciting about this series. 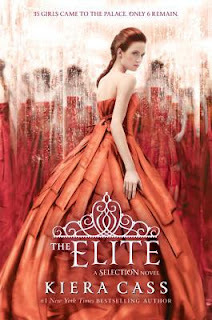 Despite having issues with some of the rules and relationships involved, I was still really excited to read the next book in the Selection series, The Elite by Kiera Cass. Because despite how much I'll grumble about how relationship-focused this dystopian series is, I still read both The Selection and The Elite within a day and I'm still looking forward to finding out how everything will turn out! The Elite picks up shortly after the end of The Selection. Thirty five girls were chosen as potential brides to Prince Maxon and now only six remain, America included. And America is still pretty uncertain if she really wants to remain in the capital and be part of this process. And America goes back and forth about this decision throughout The Elite. Not only does America question her feelings for Maxon (and her ex-boyfriend Aspen) but she's also not sure if she's princess material or if she could handle making difficult decisions that would be best for the entire country. Being in the castle and being attacked by rebel forces is bad enough, but there's an attack a bit closer to home and perpetuated by somebody that she cares about that leaves America reeling. And to make things more interesting, America no longer remains Maxon's favourite as he has chosen another that he spends a great deal of time with. There were plenty of times where I felt more than a bit frustrated by America in this book. She makes up her mind that no, she's not prepared to go any farther with this contest but then she allows Maxon to convince her otherwise very easily even when Maxon does things that goes again America's sense of morality. She sways between Aspen and Maxon a bit too readily for me. I want her to wake up one morning and realise that she no longer has to define herself and her life in relation to who she might end up with romantically. Instead of her picturing her future as either Prince Maxon's wife or Aspen's wife, I'd like her to picture herself as a strong individual who is capable of chaning things and influencing those around her in a positive way and in such a way that doesn't have to compromise her ideals or her feelings. I want that for you, America. Don't settle for somebody who doesn't stand up for what's right and certainly don't settle for somebody who chooses to keep his multiple relationships open-ended just in case but doesn't allow for anyone else to do the same. You deserve a level playing field. What I really want to see from this series is a move away from the relationship drama including America, Aspen, Maxon and at least two other girls from The Selection. I get it, she fancies both men and he's not satisfied with just the one girl either but let's move on. What I'd like to see now are more of the perspectives of the rebels fighting against Maxon's authority. More of the history behind this government and the different caste systems was uncovered during this book, what will America do with this information? Time to make a choice that's more important than this evening's dress or who is deserving of kisses. I want to see how change and revolutions happens. Bring it. I'm glad you said that. I've been wondering if it's been just me lately who is getting a bit weary of romance-led storylines. I finished this last night. Even though I've devoured both books, I have the same issues as you do with the love triangle and the double standards. I thought there was a little more history of the world in this one and the rebel attacks amped up the pace, but I still want MORE from this series! Yes. That's what I've heard from everyone else I've spoken to about this book with. Fine, there's the relationship drama, but what about everything else? The premise of the series is really interesting if only it were explored a bit more. Perhaps in the next book?